The frangipani tree (Plumeria sp), ubiquitous in the tropics, is planted extensively in Bali because of its sweet scent, interesting shape and for its cultural and religious significance. The blooms are frequently used in an assortment of decorative and ceremonial purposes. On this Seminyak site, a number of old frangipani trees, leaning in various contorted directions, cast their pristine flowers on the grass and their shade over swathes of lawn. They also serve as the inspiration for the design of the single outstanding architectural statement in this compound- an audacious steel roof framework. It’s the most eye-catching feature here- and not only because of its size and shape. Projecting over the entire mass of the only double-storey building in the compound, it seems to have a life of its own. 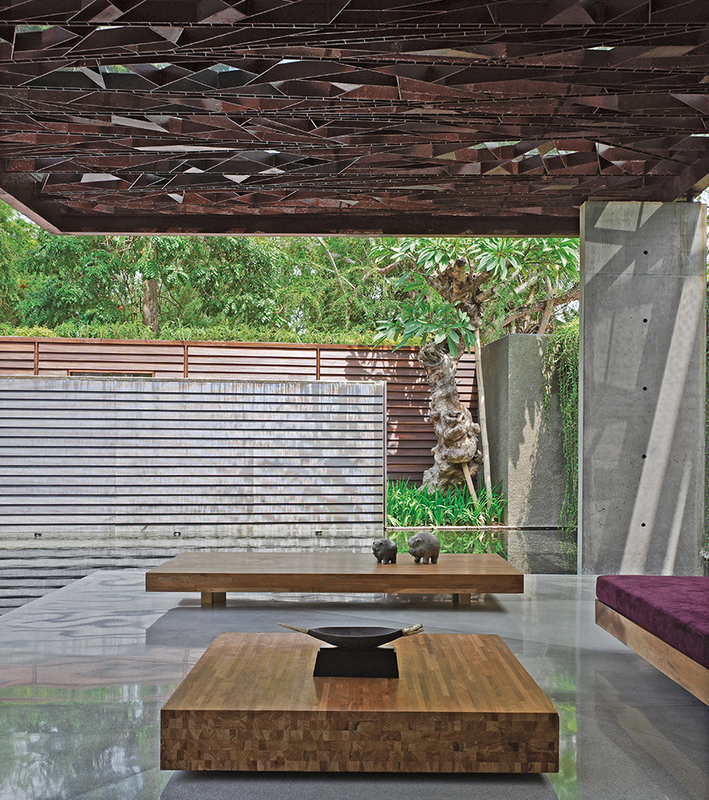 “The framework derives its shape from the branches of the frangipani,” explains Jakarta-based architect Andra Martin. “Creeping vertically and hovering horizontally over the concrete roof deck, it is extremely expressive.” Consisting of steelwork clad in wood, it is both artistic and functional: it makes a strong sculptural statement and shields the flat concrete roof from direct heat and tropical rain. Beneath its intricate webbing is a two-storey structure that stretches in an east-west alignment. The ground floor, entirely open to the elements, houses a living, dining and pantry area, while above are two children’s bedrooms. According to Matin, the building is inspired by the traditional Asian stilt house where lower levels are open to the elements and enclosure is only made at the upper levels. Throughout the day, the living quarters benefit from cross breezes, ample sunlight and a seamless connection to the surrounding gardens. The second structure, lying adjacent with only one storey, houses the master bedroom and bathroom. The architect originally intended to echo the frangipani theme with patterning on its outer perimeter wall, but this plan was abandoned after extensive discussion with the owner. Instead, the building found life as a simple glass-and-wood rectangle, with a flat roof and access to garden and pool. A third unit, located at the entrance, houses the utilities and, because of its size, effectively blocks off the sun’s western rays from penetrating the central court. Thus, the entire compound is cool and fresh day long. 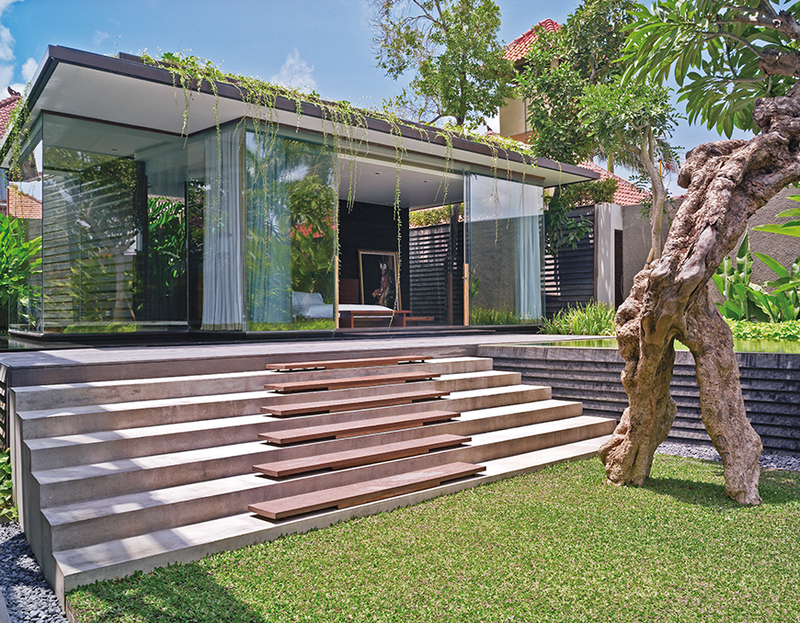 This villa, built for Indonesian businessman Mr. Joelianto Noegroho, is an innovative example of how age-old forms can be transformed into something seemingly new and modern. Taking inspiration from both its immediate surrounds and vernacular structures, the architect has built a tropical-modern home deeply rooted in its milieu. And, in keeping with traditional Balinese architecture, a perimeter wall encircles the entire compound.